The Reuse functionality is an efficient way to quickly copy multiple items and item fields within Jama. If you need to reuse a set of items but would like to only include specific fields or statuses within the item, you can do so within the Advanced Reuse Options by creating a Reuse Rule. 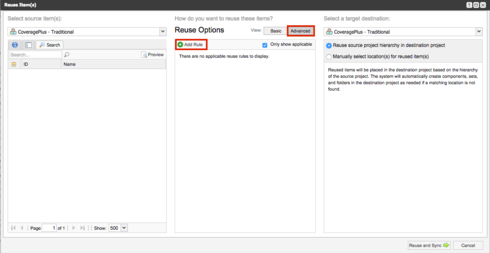 To create a Reuse Rule, open the Reuse menu by right-clicking a component, set, folder or item within the Project Tree, and select Reuse Item(s). This will open the Reuse Menu. In the center panel under Reuse Options, switch to the Advanced view, and select Add Rule. Please note: You must be a Reuse Admin to create Reuse Rules. You can set this permission level under Admin > Permissions. The screenshot below is a rule that will reuse Requirements, as well as any downstream Use Cases of the Requirements in question. Reuse Rules can include more than one Item Type, by selecting Add Item Type Rule. 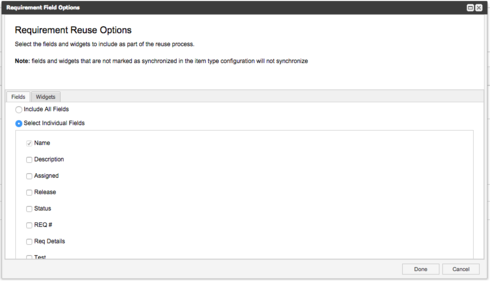 If you want items within the rule to be synced to the original items, check Sync item(s) and share Global ID. If you only want to reuse the items and not sync them, you can Append a prefix to the names of the copied items to differentiate between the original and reused item. The prefix will be added to the reused items. Lastly, you have the option to add a relationship from the reused item to the original. After you have configured what Item Types you want to reuse, you can configure which fields and widgets you would like to be included. 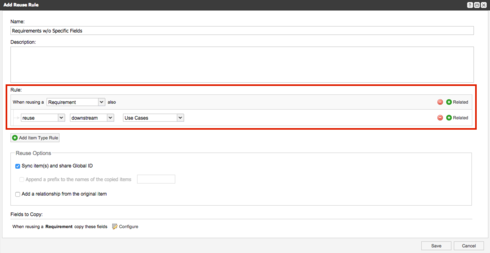 Under Fields to Copy, select the Configure button. This will open the Requirement Field Options window. Under the Fields tab, you can either have all fields of the Item Type included in the reuse, or select individual fields. If you do not select a field to be included in the reuse rule, it will be blank in the new item. You can also select which Widgets you would like to be included in the reuse. Similar to the Item Fields, Widgets that are not included in the reuse rule will be empty in the new item. After you have configured what fields and widgets to copy, save the rule. The rule will now appear under the Reuse Options. The option to Only show applicable means it will only show rules that are possible with the component, set, folder or item you have selected to Reuse. From here, you can also edit the rule, or delete it if it is no longer needed. We will need to add some rules to add around the reuse feature. But i didn't see all the fields in the list to check/uncheck. We have a field called jih proxy, which is used by JIH to sync the items between JAMA and JIRA. We do not want this field copied over when we reuse the items across the projects in JAMA. But I don't see that in the list of fields while creating reuse rules. Any idea?